Australia’s world famous Perth Mint has released another kilo (32.15 oz) silver bullion coin in their popular and limited bullion series. The 2015 Australian Silver Goat Kilo (32.15) is part of the famous Series 2 production and is struck from pure silver (.999%). It promises to be another beautiful choice for those who want to increase their silver bullion position with legal tender coins which carry a small premium. The reverse of the 2015 Australian Silver Goat Kilo features three beautifully rendered grazing goats in the natural Australian landscape. The inscriptions surrounding this image include Year of the Goat, the Perth Mint’s historic ‘P’ mintmark and the Chinese character for the goat. Those born under the sign of the Goat are said to be polite, tender, and compassionate. Struck as legal tender of Australia under the Australian Currency Act of 1965, Ian Rank-Broadley’s likeness of Queen Elizabeth II graces the front of the coin which also includes these inscriptions – ELIZABETH II, AUSTRALIA, the face value of 30 DOLLARS and includes 1KG 999 Silver and the date 2015. These freshly minted 2015 Australian Silver Goat Kilo (32.15 oz) coins are strikingly beautiful with typical Perth Mint workmanship which is superb. Both sides of the 2015 Australian Silver Lunar Goat Kilo (32.15) are a combination of a frosted matte and brilliant surface which produce the lasting contrast so popular with bullion buyers today looking for something different and beautiful which will move directly with the price of silver. Production of the Australian Silver Lunar Goat 1 oz is “capped”. This simply means the Perth Mint will produce this impressively large coin until the end of 2014. The final mintage will not be known until the end of this year but this “limited” production is small enough to be interesting but large enough to produce the reliable market commonly seen in popular silver bullion products. The 2015 Australian Silver Goat kilo (32.15 oz) comes from the Perth Mint with a few interesting touches. 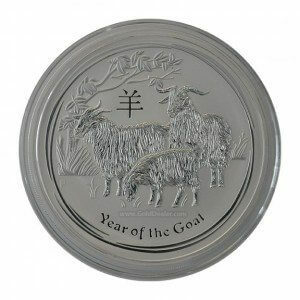 (1) The 2015 Australian Silver Goat Kilo (32.15 oz) is encased in a hard plastic container which protects the coin’s surfaces. (2) the 2015 Australian Silver Goat Kilo (32.15 oz) comes with a nicely defined “reeded” edge which provides an added layer of coin security. As always our quoted price includes free insured shipping to all 50 states and your satisfaction is guaranteed.